Glue-ups, also known as segmented turning, are a way of crafting wood. 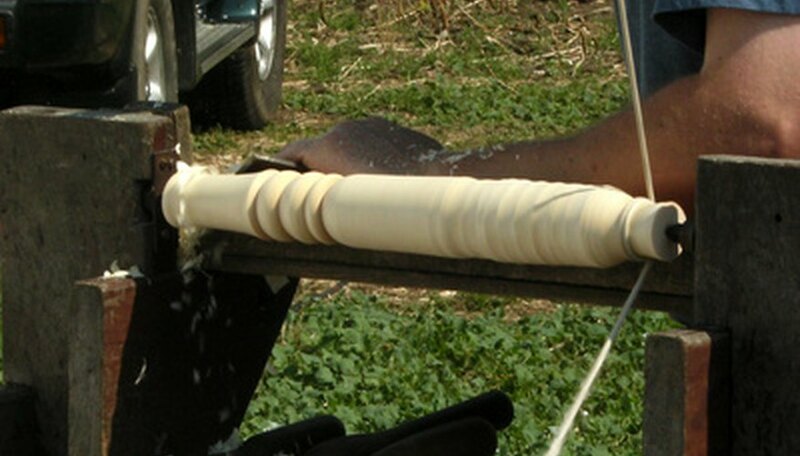 The process involves gluing pieces of wood together to create one block, which is then attached to a lathe. The woodworker cuts into this block to form his preferred shape. Glue-ups give each wooden block a unique mixture of grains, thereby adding individuality to projects. To glue up wood for wood turning, you need some basic tools and a strong wood glue. Remove any varnish, polish or paint from the surface of the wood. Use sandpaper or a sanding machine to do this. This gives you a clean piece of wood. Cut the wood to the correct width for your project. The measurement will vary, depending on your project and wood width. For example, if your wood is 8 inches wide, but your woodworking plan requires 6 inches of width, then cut off 2 inches. Cut the wood into smaller, equal lengths using a saw. Keep the pieces in order as you chop them up. Then when you glue them together, the grain will match better and look like one block of wood. Place the sections of wood together into a block. Make sure they align and fit flat against one another. This is called a "dry-fit." Disassemble the block of wood and glue the sections together. Apply glue to the first two pieces of wood. Follow the manufacturer's guidelines to make sure that the glue is applied correctly. Check that the glue is spread right to the edges of each piece of wood so that it is securely attached to the next, then clamp the pieces of wood together. Leave the wood to dry. Glue the outer surface of the wood block built in step 6, to the surface of the next piece of wood. Clamp them together and leave to dry. Repeat steps 6 and 7 until all the pieces of wood have been glued together. Do not glue them all at once, as the pieces will not align properly. Check that the glue-up is successful. Test its rigidity by wriggling it with your hands. If it's solid, attach it to the lathe for turning. Use more than one type of wood for the glue up to add different grain effects to the final woodworking project. Pick a wood glue that is suitable for the type of wood you are using and strong enough to withstand the pressure exerted during the wood turning. Wear safety goggles to protect your eyes from wood dust and debris.